A combination of lower costs and superior investment returns achieved at lower risk will result in better retirement outcomes for members. This is what the Ensimini Umbrella Funds have achieved. Many umbrella retirement fund providers would like us to believe that cost is the single most important factor to consider when selecting the most suitable umbrella retirement fund. While we at Ensimini agree that cost is one of the factors that must be considered, we believe it is not cost in isolation, but the combination of cost and investment returns, that should be the primary consideration when selecting the most suitable umbrella retirement fund. It is fantastic if the total cost of participating in a retirement fund is less than 1% of a member’s fund credit, but if this is combined with underlying investments that are underperforming its objective, benchmark or peers by as little as 1%, the benefit gained through the lower fees means absolutely nothing. The graph in Example 1 on the right provides an illustration of the impact of a mere 1% investment return differential on the member’s final retirement benefit over a 30-year period. While we used an asset-based fee as the basis in Example 1 on the right, we do not believe it is fair to charge an asset-based fee to perform administrative services. The Ensimini Umbrella Funds were designed with a flat administrative fee commensurate with the work done by the administration team. Investment returns will not be used to cross-subsidise the cost of administration or any other costs, ensuring that members earn their full return on the underlying investments. * A reduced fee will apply for employers with more than 250 members on the Fund. Fund Operational costs are charged as and when incurred and are recovered proportionately from the members in respect of whom the costs relate. These costs include audit fees, FSCA (formerly FSB) levies, independent trustee costs, bank charges etc. All fees are disclosed in full on member statements. The graph in Example 2 on the right provides an indication of the comparative retirement outcomes between Fund X and the Ensimini Umbrella Funds where the Ensimini Umbrella Funds standard investment management and administration fees are used (with the latter increasing at CPI annually) and Fund X’s fees are set at 1% of assets per annum (inclusive of investment management and administrative costs). The same investment returns have been used for both. The result is a significantly better retirement outcome for the member on the Ensimini Umbrella Funds. If the Ensimini Umbrella Funds’ default investment strategies continue to outperform that of its peers, members of the Ensimini Umbrella Funds could enjoy the combined impact of the better retirement outcomes displayed in both examples. It is evident that the optimal combination between lower costs and superior investment returns, achieved at lower risk, offered by the Ensimini Umbrella Funds, will result in significantly better retirement outcomes for members compared to the options used in the examples. For more information on our Umbrella Funds, view the Ensimini Umbrella Pension Fund or Ensimini Umbrella Provident Fund brochures. 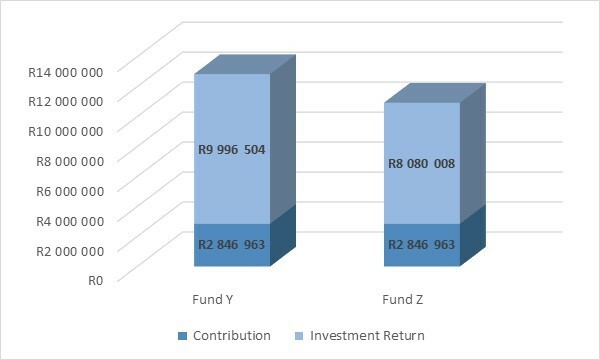 This example uses a member with a starting fund credit of R0 that earns R300,000 per annum and makes a net retirement funding contribution of 12% before costs. Investment returns of 12% and 11% were used for Fund Y and Fund Z respectively. This example uses a member with a starting fund credit of R500,000 that earns R300,000 per annum and makes a net retirement funding contribution of 12% before costs. Investment returns of 12% were used for both funds. 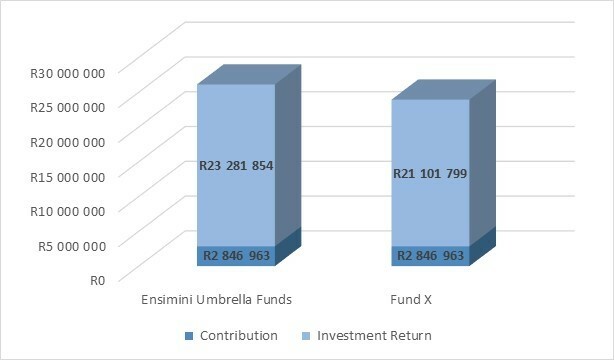 The Ensimini Umbrella Funds’ standard investment management and administration fees (with the latter increasing at CPI annually) were used, whilst a fee of 1% of assets per annum (inclusive of investment management and administrative costs) was used for Fund X.